After the debacle against the Dallas Stars last week, the Washington Capitals needed a rebound. Coach Bruce Boudreau punished the team with some nasty practices and in the first of this home-and-home series against the New Jersey Devils, it seemed to have made an impact. The Caps finished strong in their 3-1 victory at Prudential Center. The Caps overcame a sloppy and slow first half of the game, erasing the Devils’ early lead with a couple of opportunistic goals by Alex Ovechkin and Marcus Johansson. The game turned in the second period after some solid and consistent play by the Caps kept the Devils from capitalizing on any opportunities. 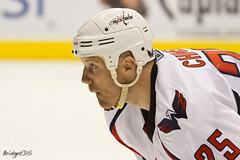 Jason Chimera’s game-winning goal was a combination of power and grace, plowing through a pair of Devils and outskating Devils’ rookie Adam Larsson to the goal mouth, then faking goalie Martin Brodeur to snap home a shorthanded goal. It’s easily the pivot moment of the game. Alexander Semin had just over 8 minutes of ice time in the game, with only 16 seconds coming in the final 35 minutes. Semin took a 2 minute hooking call halfway into he first period. The first period start was hideous for the Caps, who took only 3 shots in the first 19:50. Mike Green, who had just returned after missing six games with an ankle injury, went down late in the first period in a collision with New Jersey’s Ryan Carter. According to the Caps, the injury is not the ankle and Green will likely be out short-term. “If you look through history, and I wouldn’t want to do the calculating, but when you score a shorthanded goal in a tight game, that team almost always wins,” said Coach Boudreau when asked how important Chimera’s shorthanded goal was.